Thinking about traveling to Colorado? Make sure to add Fort Collins to your list of destinations. As the most popular city in the Northern Colorado region, Fort Collins is known for its craft breweries, old town area and outdoor lifestyle. 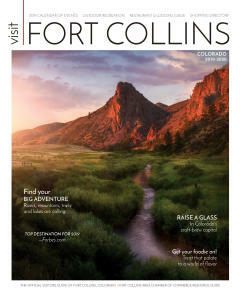 I’ll be providing multiple insider guides to help you plan your (hopefully) upcoming trip to FoCo! As a city that has been voted a ‘Best Place to Live’ over ten times in the past fifteen years, it’s no secret that Fort Collins has become popular for tourists and home buyers alike. So what’s all the hullabaloo about, you ask? Personally, I have lived in Fort Collins for thirteen out of my twenty-four years of life. This gave me the opportunity to experience activities as a child, teenager, and adult. Let me tell you, Fort Collins is pretty amazing. Keep reading to get an idea of what it is you can expect to do in a day while visiting! When starting your day, head on over to Little Bird Bakery in Old Town Square. Grab a cup of joe and a delicious pastry, and enjoy people watching through the large windows. If it’s summertime and you have kids, bring their bathing suits so they can romp around in the fountain area right outside. Afterward, head on over to the Foothills Trail in the Maxwell Natural Area, only fifteen minutes away. Here, you can take a short two-mile hike to the top where you’ll get an amazing view of the city (not to mention Horsetooth Reservoir) without having to pay for parking at more popular and crowded destinations, like Horsetooth Rock. Lunch will be in order after your hike, and I recommend trying out FoCo Cafe. Run by volunteers, they offer healthy, yet hearty options for a ‘pay what you can’ price. Frequented by visitors and locals alike, you’ll leave satisfied and happy to have contributed to a local non-profit! After lunch, walk a couple blocks to the Fort Collins Museum of Discovery, or hit up The Lyric Cinema for an off-beat film. In the late afternoon beer will most likely be in order. With more than twenty craft breweries to choose from, the Fort Collins brewery scene has been dubbed the Craft Beer Capital of Colorado. I would recommend starting at either Odell or Zwei! If beer isn’t your thing, head to Happy Lucky’s for a relaxing cup of tea. When dinnertime strikes you will have an endless amount of options to choose from (be sure to look out for my guide on where to eat in my next Insider&apos;s Guide). If I had to choose just one eatery to recommend, it would probably be Rodizio Grill. This Brazilian steakhouse has two locations in Colorado, one in Denver and one in Fort Collins. Bring a large appetite, because the food here is limitless. You can choose the ‘full rodizio’ with meat included, or just stick to the elaborate salad bar. After dinner everyone will probably be ready to go into a food coma, so head back to your hotel of choice (The Elizabeth is an amazing downtown option). If the night still feels young, walk to Ace Gilletts for a handcrafted cocktail and jazz. This intimate lounge is located underneath another iconic hotel, The Armstrong, which can prove to be another wonderful place to stay. If this leaves you wondering what else there is to do in Fort Collins during your stay, I will be providing more insider tips on that in the near future.